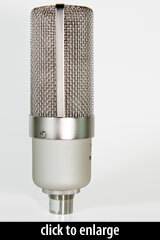 The 46U is a third-generation passive ribbon microphone, built by hand by ShinyBox founder Jon Ulrigg. Like its immediate precessor, the Shinybox 46MX, the 46U is a long-geometry, low-tension ribbon design; unlike the 46MX, the 46U incorporates a new, custom-wound output transformer, as well as numerous other improvements developed by Ulrigg. The ribbon gauge, tension, and crimping style are matched to the output transformer; according to Ulrigg, each of the models in the “46” product line uses a subtly customized ribbon, to best suit the sonic qualities of their respective transformers. The 46U ships in a foam-lined aluminum flightcase and includes an elastic shockmount and a padded, zippered storage pouch.